Bugs! 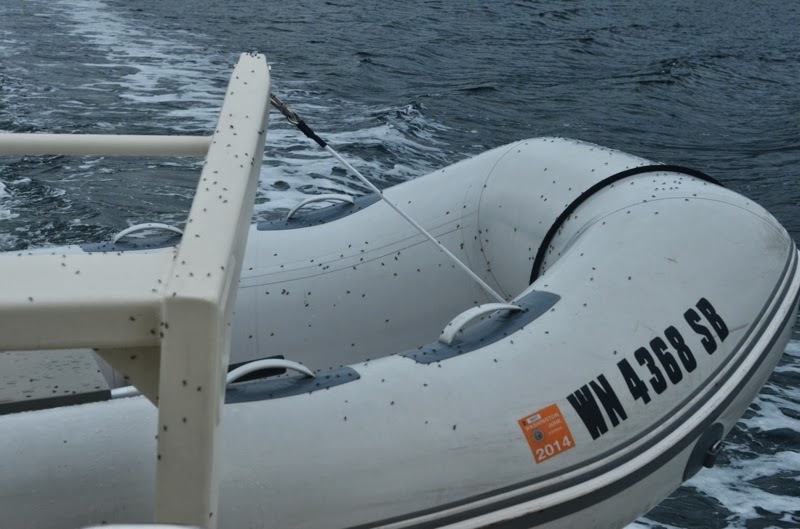 The boat is covered in bugs! I went outside to pull the anchor and couldn’t believe the thousands of bugs hanging out on the boat. Yeah, I don’t think I’ll do any kayaking or dinghying here. Look at all the bugs! We motored down to Kake, seeing quite a few whales along the way. After a quick stop at the fuel dock to top off the water tank we moved offshore and dropped the anchor. We needed to grab a few groceries and also visit the liquor store. We checked off those two errands, then continued towards Goose Bay. Hans and Terri on Mellow Moments recommended Goose Bay thoroughly. They’d seen bears and a moose here earlier this summer. We made it through the narrow, shallow entrance just fine and dropped the anchor, the only boat here. We explored a bit by dinghy, but didn’t find any wildlife immediately. 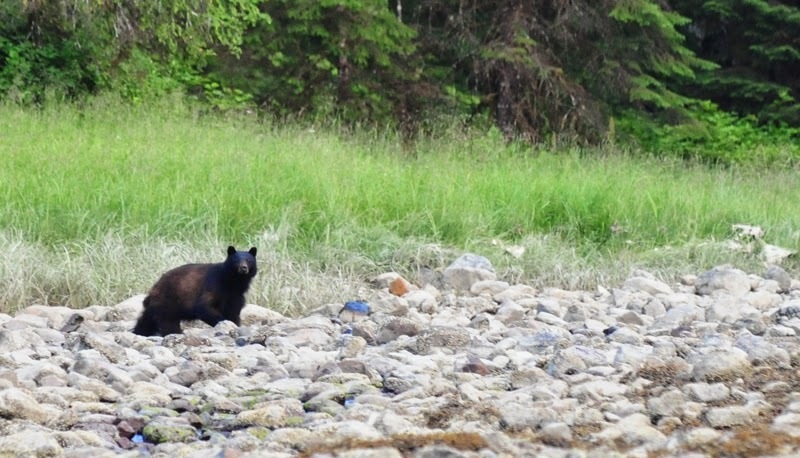 Later on, after dinner, Erik spotted a black bear sow with two cubs. We hopped in the dinghy and approached as quietly and close as we could. This is a particularly quiet anchorage. As we drifted in the dinghy watching the bears, we could literally here as birds flew overhead, their wings fanning the air. Sow, after her cubs had scrambled into the woods.